"Cloves" redirects here. For the singer, see Cloves (singer). Cloves are the aromatic flower buds of a tree in the family Myrtaceae, Syzygium aromaticum. They are native to the Maluku Islands in Indonesia, and are commonly used as a spice. Cloves are commercially harvested primarily in Bangladesh, Indonesia, India, Madagascar, Zanzibar, Pakistan, Sri Lanka, and Tanzania. Cloves are available throughout the year. Cloves may be used internally as a tea and topically as an oil for hypotonic muscles, including for multiple sclerosis. This is also found in Tibetan medicine. Some recommend avoiding more than occasional use of cloves internally in the presence of pitta inflammation such as is found in acute flares of autoimmune diseases. Clove oil can be used to anesthetize fish, and prolonged exposure to higher doses (the recommended dose is 400 mg/l) is considered a humane means of euthanasia. Brown cloves are expanded flowers from which both corollae and stamens have been detached. Archeologists have found cloves in a ceramic vessel in Syria, with evidence that dates the find to within a few years of 1721 BC. In the third century BC, a Chinese leader in the Han Dynasty required those who addressed him to chew cloves to freshen their breath. Cloves were traded by Muslim sailors and merchants during the Middle Ages in the profitable Indian Ocean trade, the clove trade is also mentioned by Ibn Battuta and even famous Arabian Nights characters such as Sinbad the Sailor are known to have bought and sold cloves from India. 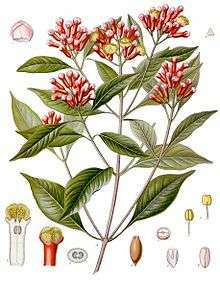 Until modern times, cloves grew only on a few islands in the Moluccas (historically called the Spice Islands), including Bacan, Makian, Moti, Ternate, and Tidore. In fact, the clove tree that experts believe is the oldest in the world, named Afo, is on Ternate. The tree is between 350 and 400 years old. Tourists are told that seedlings from this very tree were stolen by a Frenchman named Poivre in 1770, transferred to France, and then later to Zanzibar, which was once the world's largest producer of cloves. Eugenol comprises 72–90% of the essential oil extracted from cloves and is the compound most responsible for clove aroma. Other important essential oil constituents of clove oil include acetyl eugenol, beta-caryophyllene and vanillin, crategolic acid, tannins such as bicornin, gallotannic acid, methyl salicylate (painkiller), the flavonoids eugenin, kaempferol, rhamnetin, and eugenitin, triterpenoids such as oleanolic acid, stigmasterol, and campesterol and several sesquiterpenes. Eugenol is toxic in relatively small quantities; for example, a dose of 5–10 ml has been reported as a near fatal dose for a two-year-old child. 1 2 "Syzygium aromaticum (L.) Merr. & L. M. Perry". Germplasm Resources Information Network (GRIN). Retrieved June 9, 2011. ↑ "Flavored Tobacco". FDA.gov. Retrieved September 7, 2012. ↑ "Get Rid of Ants 24". getridofanst24. ↑ Alqareer A, Alyahya A, Andersson L (May 24, 2012). "The effect of clove and benzocaine versus placebo as topical anesthetics". Journal of dentistry. 34 (10): 747–50. doi:10.1016/j.jdent.2006.01.009. PMID 16530911. ↑ "Question: Multiple Sclerosis". TibetMed. Retrieved September 7, 2012. ↑ Tillotson, Alan (April 3, 2005). "Special Diets for Illness". Oneearthherbs.squarespace.com. Retrieved September 7, 2012. 1 2 "Clove". MedlinePlus, U.S. National Library of Medicine and National Institutes of Health. 2014. Retrieved August 18, 2014. 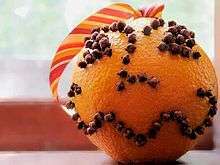 ↑ "Clove (Eugenia aromatica) and Clove oil (Eugenol)". National Institutes of Health, Medicine Plus. nlm.nih.gov. February 15, 2012. Retrieved September 7, 2012. ↑ Monks, Neale. "Aquarium Fish Euthanasia: Euthanizing and disposing of aquarium fish.". FishChannel.com. Retrieved August 1, 2011. 1 2 Turner, Jack (2004). Spice: The History of a Temptation. Vintage Books. pp. xxvii–xxviii. ISBN 0-375-70705-0. ↑ "The Third Voyage of Sindbad the Seaman - The Arabian Nights - The Thousand and One Nights - Sir Richard Burton translator". Classiclit.about.com. April 10, 2012. Retrieved September 7, 2012. 1 2 3 Worrall, Simon (June 23, 2012). "The world's oldest clove tree". BBC News Magazine. Retrieved June 24, 2012. ↑ Li-Ming Bao, Eerdunbayaer; Akiko Nozaki; Eizo Takahashi; Keinosuke Okamoto; Hideyuki Ito & Tsutomu Hatano (2012). "Hydrolysable Tannins Isolated from Syzygium aromaticum: Structure of a New C-Glucosidic Ellagitannin and Spectral Features of Tannins with a Tergalloyl Group.". Heterocycles. 85 (2): 365–81. doi:10.3987/COM-11-12392. ↑ Hartnoll, G; Moore, D; Douek, D (1993). "Near fatal ingestion of oil of cloves". Archives of Disease in Childhood. 69 (3): 392–3. doi:10.1136/adc.69.3.392. PMC 1029532 . PMID 8215554. Liu, Bin-Bin; Liu, Luo; Liu, Xiao-Long; Geng, Di; Li, Cheng-Fu; Chen, Shao-Mei; Chen, Xue-Mei; Yi, Li-Tao; Liu, Qing (February 2015). "Essential Oil of Syzygium aromaticum Reverses the Deficits of Stress-Induced Behaviors and Hippocampal p-ERK/p-CREB/Brain-Derived Neurotrophic Factor Expression". Planta Medica. 81 (3): 185–192. doi:10.1055/s-0034-1396150. Retrieved 27 April 2015.